Each month, I profile some of my favorite supplements that I find to be the most beneficial for women. At the top of this list is the Beverly International Glutamine Select. Over the last 10 years, I have been personally using Glutamine Select and recommending it to all of my training clients because of the huge impact it has on decreasing soreness after a hard workout. I feel a noticeable difference on the days after I take Glutamine Select during a super tough workout and on those days where I do not. Very few supplements will give you that kind of concrete proof that they work! Let’s dive in and find out why that’s happening and if this is a good supplement for you to include along with your overall nutrition plan. The development of Glutamine Select™ rests on solid scientific grounds. By partnering glutamine with BCAA in quantities clinically-proven to be effective in athletes, its tremendous anabolic energy can finally be uncapped, enabling users to achieve levels of muscle protein, glycogen, mass, strength and hardness not possible by relying on the diet alone. This uniquely energizing effect is something you can only fully appreciate by trying Glutamine Select™ for yourself. Once you do, you will see why it is referred to as the “red bull” of bodybuilding amino acid formulas. 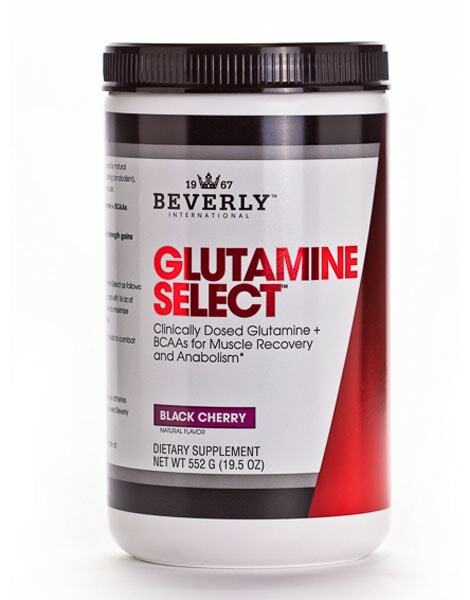 What makes Beverly International Glutamine Select different from other glutamine-containing supplements? A. Clinically-proven quantities: Large quantities of glutamine and BCAA are required to produce the effects sought by bodybuilding athletes, such as increases in muscle mass, hardness and overall performance, and faster recovery from training. Whereas some glutamine supplements contain only glutamine, each serving of Glutamine Select™ supplies 5 grams of glutamine plus 3 grams BCAA. These are the exact same quantities of glutamine and BCAA shown to improve the muscle-building effects of whey in resistance trained athletes (Colker, 2000). Whey is frequently regarded as the most anabolic protein in the world. Subjects in the Colker study who received the whey fortified with glutamine and BCAA gained approximately two pounds more of muscle and doubled their strength as compared to those receiving regular whey only. B. Pharmacologically-active form: The glutamine and BCAA in Glutamine Select™ are free, i.e., not bound to proteins. In this form they can produce pharmacological actions not possible through the consumption of food. Though glutamine is abundant in many protein supplements, typically it is protein-bound glutamine, which cannot raise plasma glutamine levels as quickly as can free glutamine. A study published in the International Journal of Sports Medicine (van Hall et al. 2000) found that a drink containing free glutamine doubled plasma glutamine levels in trained subjects, whereas plasma glutamine levels were not affected by the consumption of either a wheat protein hydrolysate (providing 26% glutamine) or a whey protein hydrolysate (providing 6.6% glutamine). Wheat protein hydrolysate is sometimes added to protein powders and other supplements to increase their glutamine content. C. Refreshingly delicious taste: Beverly’s R&D scientists used a proprietary cherry flavor system to make Glutamine Select™ taste as delicious as it is anabolically energizing. D. Tested and reviewed for safety and purity: Like the rest of Beverly’s formulas, all of the ingredients in Glutamine Select™ have been tested and reviewed for safety and purity. The glutamine and BCAA, in particular, meet United States Pharmacopeia (USP) standards. E. Less than $1 per serving: Glutamine Select™ costs less than $1 per serving. Compare this to the potential gains in muscle protein, glycogen, mass, strength and hardness. They are priceless. i. Glutamine is known as an anaplerotic substrate for its ability to replenish the supply of intermediates in the Krebs (tricarboxylic acid) cycle. The Krebs cycle is involved in the re-synthesis of ATP. ATP is as real as energy gets. Without ATP, muscle contraction stops, as does anabolism and life itself. ii. Glutamine is a glucogenic amino acid, meaning that it can be converted into glucose. Glucose is the body’s most important fuel. Glutamine is considered by some scientists to be the body’s most important glucogenic amino acid. iii. The BCAA are also an important source of energy. They supply ATP for the liver and muscle tissue. Supplementation with BCAA helps maintain BCAA levels and vice versa. iv.Glutamine and BCAA have independently been found to stimulate muscle glycogen synthesis. Per gram ingested, glutamine has actually been shown to replenish muscle glycogen levels more efficiently than carbohydrate. Some of the benefits provided by glutamine and BCAA supplementation can occur within minutes of supplementation, whereas others may be noticeable after a few days or weeks. For instance, Bruce et al. (2001) gave subjects 0.125g of glutamine/kg bodyweight one hour before exercise. Plasma glutamine levels increased within 60 minutes, reaching a peak of 51%. Glutamine increased the supply of Krebs cycle intermediates in muscle tissue during exercise. The muscle content of glutamine at rest was also higher in subjects receiving glutamine. When football players supplemented with glutamine (0.100 g/kg bodyweight) for 5 days prior to exercise, it reduced the accumulation of ammonia in the blood during exercise (Bassini-Cameron et al. 2008). Ammonia is a potentially toxic by-product of metabolism which has been blamed as a cause of fatigue. Bowtell et al. (1999) had subjects exercise until their muscle glycogen levels were depleted. They then consumed either 8g of glutamine or a glucose polymer drink. Plasma glutamine levels began increasing immediately after consuming glutamine and peaked within 30 minutes, by 46%. During 2 hours of recovery, the glutamine-only drink was found to be just as effective as the glucose polymer at stimulating net muscle glycogen storage. Yet it raised insulin levels less. Increases in muscle mass and strength while using Glutamine Select™, may require several days or weeks to notice, depending on the number of servings consumed each day and other factors. However, being that muscle glycogen status affects not only protein synthesis but also muscle fullness, hardness and vascularity, it is quite possible that you may notice improvements in these things within as little as 24-48 hours. Can Beverly International Glutamine Select help me burn calories? Yes. As a glucogenic amino acid, glutamine stimulates gluconeogenesis. Gluconeogenesis refers to the conversion of amino acids and other non-carbohydrate substances (e.g. glycerol) into glucose. Gluconeogenesis requires ATP, which is supplied by the burning of fat calories. When healthy subjects were administered glutamine enterally, it increased their resting energy expenditure (REE), from 1531 kcal/day to 1842 kcal/day (Hankard et al., 1996). Giving the subjects the amino acid glycine, in contrast, produced no significant change in REE. Glutamine, but not glycine, was also shown to stimulate protein synthesis. “I LOVE Beverly International Glutamine Select plus BCAAs!! Recently, my strength gains were stalled and I wanted to try something new. The Glutamine Select product has helped me break past the barrier that was preventing my workouts from progressing the way I wanted them to. In addition, I won’t go without this supplement for the first-rate muscle recovery I get using it. I’m currently on an intense 5-day a week training split that trains one body part per day. Prior to using the Glutamine Select, if I worked legs, I could hardly walk the next day! Washing my hair became a chore because I couldn’t move my arms on Bi/Tri day. Once I added Glutamine Select to my program, I’ve not had the muscle soreness, fatigue, or strength problems I experienced previously. I’ve tried the Glutamine Select as both a post-workout drink and as a during-workout drink and, in my experience, taking the Glutamine Select in the 2 scoop/16 oz. water combination is the ticket to my training success. I’ve tried other Glutamine supplements from other well-known supplement companies and they don’t even compare to the Beverly product with regard to how well they work and how quickly you notice the differences. I would recommend it to anyone looking to increase their strength or looking to combat post-intense workout fatigue and to support recovery.